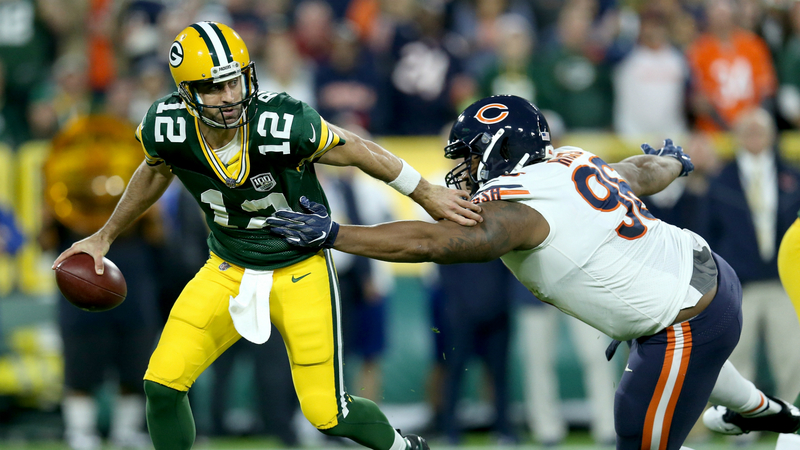 But as Packers fans feared the worst, Rodgers made a surprising return to the field in the second half. What happened next might go down in Packers’ lore as the “Cart Comeback” game. Did you think arguably the NFL’s best player wouldn’t try to come back and lead his team to victory? The last time Rodgers left the field on a cart, no good news came from it. This time around, he went down grabbing his knee, stood up, went down again before limping off the field. He was seen shaking his head when he finally made it onto the cart headed for the locker room. Again, it looked pretty grim — until it didn’t. There’s little the three-time Pro-Bowl linebacker didn’t do. In the first half of his first outing in blue and orange, Mack recorded a strip sack, ran back a pick-six to push the Bears’ lead and added another sack on top of all that. His performance was worthy of the heavy price tag that came with his six-year, $141 million contract. But as he showed against the Packers, it was well worth it. Mack finished the game with three total tackles — two solo — the sack and fumble recovery. It was night and day between the first- and second-half offenses of both teams. The Bears came out and earned their first 10-point lead over the Packers since 2007, with Bears quarterback Mitchell Trubisky looking sharp. Meanwhile, Chicago’s defense blanked Green Bay 17-0 in the first half. He moved in and out of the pocket and escaped the wrath of the Packers’ defense to extend drives in the first half. But late in the game, he missed and/or rushed some throws and looked like a different quarterback.